Home » 2014 Categories » 2014 Technical Presentation » The association between urban sprawl and obesity: is it a two-way street? By Tatiana in 2014 Technical Presentation on April 11, 2014 . Emily, I think you did a great job with your technical presentation. You provide important and relevant background information. Your presentation of the model is well laid-out and easy to understand. Given the staggering levels of obesity in the US, the issues studied by Platinga and Bernell are especially timely and relevant. 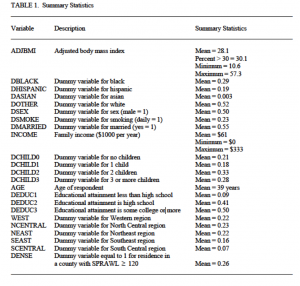 The paper finds meaningful conclusions regarding the influence one’s BMI has on the decision to live in certain locations of varying density. It would be helpful to discuss the p-values of the coefficients for movers and non-movers so as to evaluate the significance of the results. Overall, you provide an excellent piece that touches upon all the critical components of the paper. Emily, I enjoyed reading your technical presentation. I thought that you laid out the more mathematical/technical portion of the paper in a manner that lay people can understand easily, which made reading this paper a more pleasant experience. 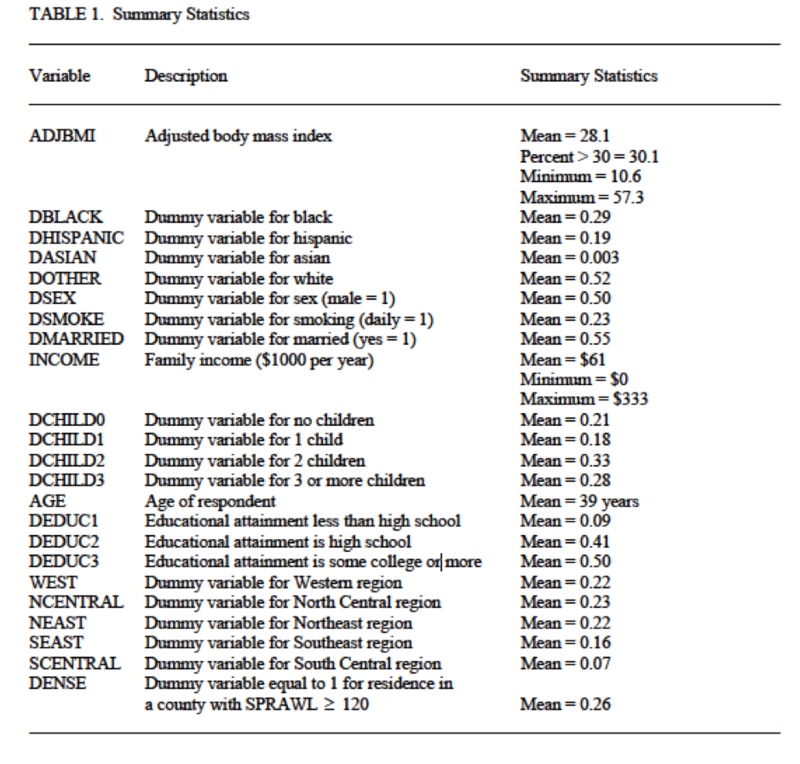 This paper find the correlation between an individual’s BMI and location of housing. As we’ve learned throughout this semester, there are other correlations related to urban sprawl that could potentially influence these findings. For example, various racial discriminatory factors have led to a predominantly white suburbia and racial/ethnic central city. It would be interesting to see how BMI has changed within the central city as urban sprawl continues to take place. I definitely liked how your paper was presented and how easy it was to follow. This topic is also very interesting; when we think of the negative effects of urban sprawl, nutrition of residents is usually not the first thing that comes to mind. I really believe that there might be additional factors that affect BMI that you may want to look into (i.e. demographics, increase in technologies). There are a few papers that I know Prof. Komlos has published that has looked into similar relationships regarding BMI due to urbanization.